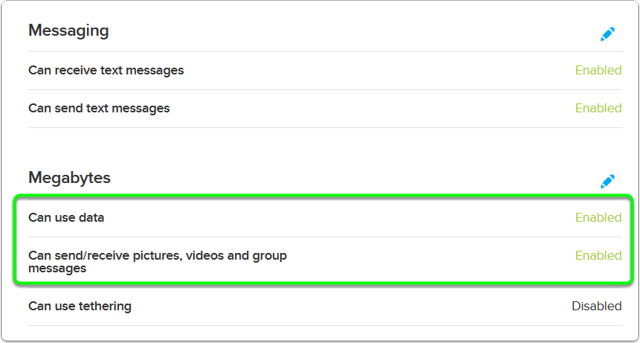 If you're having trouble sending group text (SMS) messages, you may need to update your account and messaging app settings. When you send a text message to multiple recipients, most smartphones will send it as one message rather than several individual messages. In order to send it as one group message though, the message has to be converted to a multimedia or MMS message, even though there is no picture or video attachment. Some phones make this very obvious by actually telling you it's converting the message to MMS as soon as it detects that there are multiple recipients. When you send group messages as MMS, it keeps the replies in one thread on your phone. 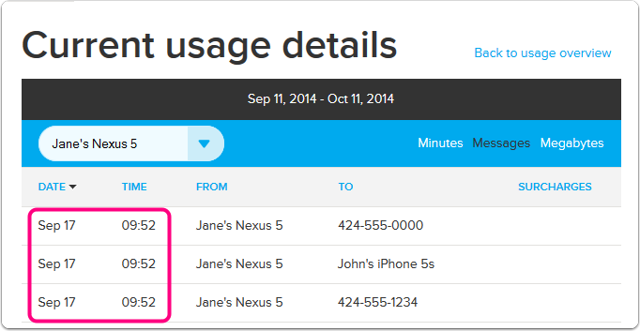 It also doesn't count towards your text messaging usage, so you won't see those messages reflected in the text messaging detail on your monthly bill. In order to send a group text as one message, you'll first need to ensure that you have both data and MMS messaging enabled on your account. 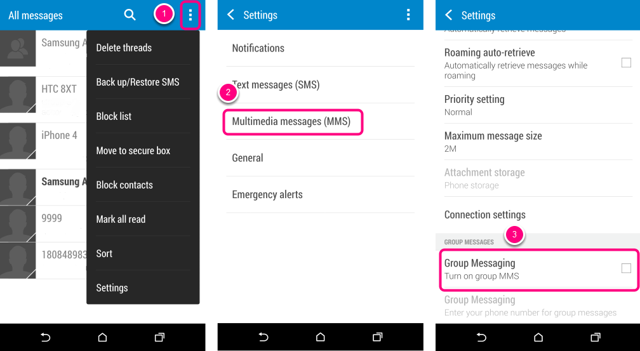 Once you've got data and MMS messaging enabled on your account, you'll want to ensure that the group MMS option in your phone's messaging app is enabled. Follow the directions below that apply to your phone. 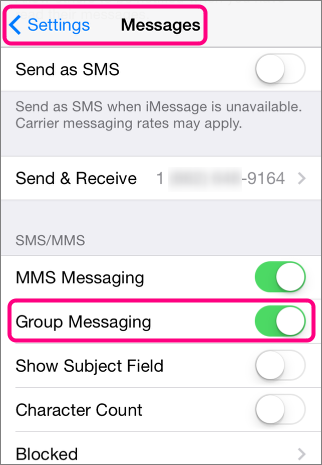 Of course, if you want to want to send group messages as individual text messages on your phone, just follow these directions and disable the option instead. While these directions are for the native messaging apps on these phones, they apply to similar messaging apps as well, including Google Hangouts. Go to the main screen of your messaging app and tap the menu icon or menu key (on the bottom of the phone); then tap Settings. If Group Messaging isn't in this first menu it may be in the SMS or MMS menus. 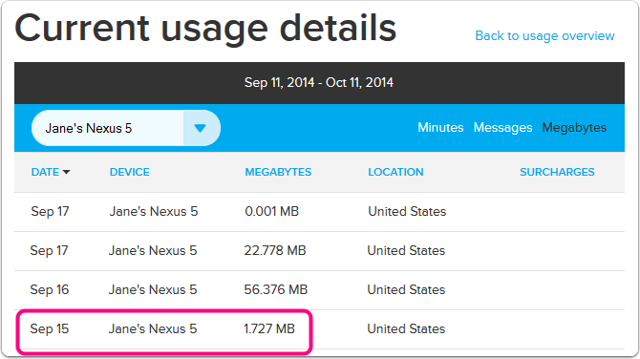 In the example below, it's found in the MMS menu. 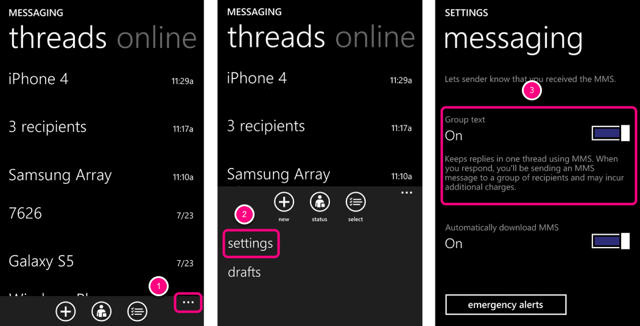 Under Group Messaging, enable MMS. Go to the main screen of your messaging app and tap the menu icon; then tap Settings. Under Group text, enable MMS. If you have a feature phone, this shouldn't be an issue since feature phones will split group messages into individual messages by default. Additionally, if you're using a messaging app like What's App or any number of others, this should not be an issue.